As we have mentioned numerous times in Bus and Coach Buyer, keeping vehicles clean is all part of what can be done to attract and retain passengers. This is not too hard to do with a smaller fleet, but as vehicle numbers get higher and depots to house them get larger, it becomes an ever increasing challenge. One solution to this is to hire external help. That is what has been done at West Ham Bus Garage in London, taking on the services of Cordant Cleaning. 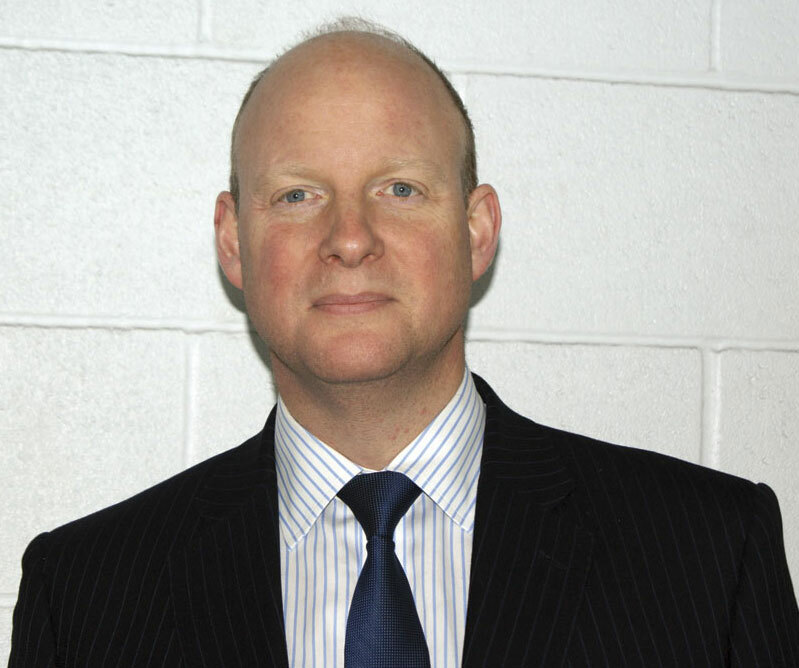 Chris Peat visited the depot and met the cleaning company’s MD, Guy Pakenham, to get an insight into what the business does and how this has benefitted the London depot and others across the country. Built by TfL in advance of the Olympics four years ago, West Ham Bus Garage is occupied by Stagecoach. As well as buses for its portfolio of TfL routes, coaches from the operator’s megabus Gold sleeper service are also based there. With a moss roof, the site has modern vehicle servicing and maintenance facilities, as well as offices and a staff canteen, where I met Guy. Sitting down with him, he explained that Cordant is not just about cleaning. There are two distinct parts of the business, including a recruitment arm that serves some of the UK’s largest retailers, in addition to its cleaning and security division. The latter arm is where it works with the bus and coach industry. Cordant has not always been involved with cleaning PCVs, this activity being added to its offerings when it acquired Interclean Bus Services. This company had been founded by Guy in 2001 and was taken over by its now owners in 2007, running for a time under the Dynamiq name before rebranding as Cordant. Cordant provides shunters, fuelers and allocators, as well as premises and vehicle cleaners. It currently works at more than 40 garages across the UK, predominantly in London, taking care of approximately 6,500 vehicles every night. It is the largest supplier of hired cleaning to bus depots in the capital, taking care of over half of them. Hired cleaning certainly seems to be proving popular, but what is it that attracts so much business to the company? There are a number of benefits to using his service, according to Guy, the first being that it improves standards of cleanliness. The reason being, he explained, is because this is the operation’s ‘core business’, its reputation relies on it. Using Cordant reduces costs compared to doing the work in house, he claims, particularly in terms of purchasing cleaning materials and having to deal with terms and conditions of labourers’ contracts. It also cuts out a lot of management time, with the entire cleaning side looked after by Cordant. A fourth benefit is that it is safer, which again relates back to the fact cleaning is the company’s core business. The firm has produced a bespoke health and safety manual and new induction video for its employees, something Guy said operators would probably never have time to develop themselves for their own cleaning staff. It is also able to carry out a work and risk assessment, which is specific to individual roles, so one for shunters and another for cleaners for example. The work Cordant carries out covers the entire cleaning process. During the day, the company deploys its premises cleaners, who not only do all offices and rooms, but wash the workshop down, sweep the yard and clean the pits. They will also do pre-MOT cleans; a special deep annual clean of vehicles. During the night, between 16.00 and 03.00 when the fleet returns to the depot, the vehicles are handed over to the shunters. Default cards are collected and an internal and external assessment is made to check for damage. The vehicle is swept, surfaces dusted and all litter removed. After that, they are fuelled, followed by topping up the AdBlue and other fluids. 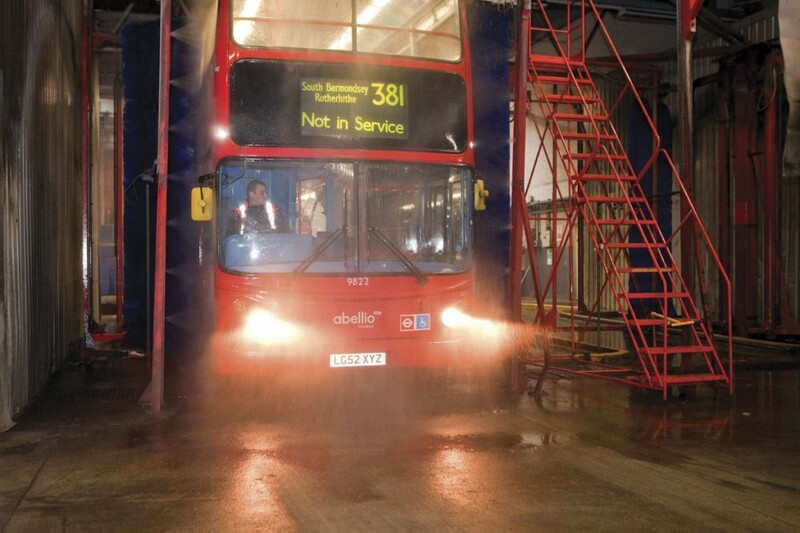 A wheel and lower panel pre-wash is carried out before the vehicles are put through the bus wash. The front shunters then take them to be parked accurately to the garage plan. Additionally, Cordant staff do periodic and enhanced cleans, which often includes a weekly and an eight weekly wash. These are much more extensive than the above mentioned clean. This is further to an annual intense clean the vehicles get, which is often done when it is off the road for a day. It is a ‘high level of cleaning’ that is carried out, said Guy. Considering the extent of this service, Guy said depots outside of London with fewer than 50 vehicles ordinarily have their cleaning done in house. 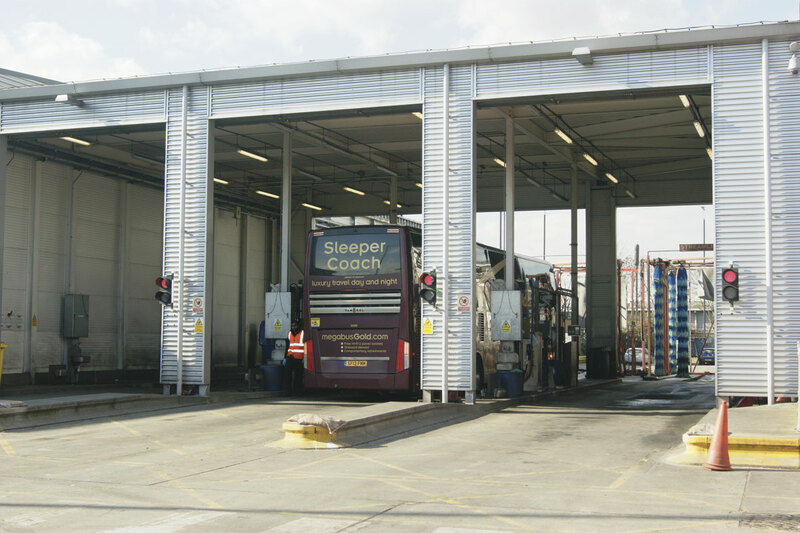 London depots, which easily meet the 50 plus vehicle number, have ‘very much embraced this operation’. The company always contracts with the operator, rather than TfL or any other local authority. He described the operation as an extension of an operator’s business, saying they play a ‘significant part’ of that company’s activities. At some points in the day, there are more staff from Cordant in a depot than those directly employed by the operator. As can be imagined, the company liaises with its customer’s management team daily. Cordant’s team itself includes a number of Operations Managers, who take on the responsibility of three garages each. These are then answerable to the company’s Operations Director. They look after their staff’s wellbeing. Guy knows cleaning in depots is not the easiest of work to do, saying welfare facilities for their staff are often less luxurious than the operator or Cordant would ideally like. Space for the cleaning team is often not a top priority, he claims. Most garages are very exposed to the elements, so in winter they can be very tough to work in. There is often no hot running water either, he said. Another challenge is with bus washes, which can freeze up in the winter. Issues can arise around multi-cultural staff too, with different language abilities another problem, especially when vehicles are driving around making it a potentially hazardous place. As such, Cordant carries out extensive and strict health and safety procedures, with its own dedicated health and safety manager. An induction video has recently been developed and will be shown to staff when they start with Cordant. Bespoke bus and coach relevant health and safety briefings are also given to the employees. These are performed once a month for regular cleaning staff, but weekly for shunters. It employs its own driver trainer for these latter workers, who all have insurance in case of accidents. About 20% of its shunters hold PCV licences as they are occasionally required to shunt on the public highway. However, they are exempt from the 35 hour training requirements. All of its workers have ID cards that show what they are authorised to do. Random drug and alcohol testing is carried out on all its labourers. Unsurprisingly with all of this in place, the company has achieved Investors in People status. Guy said Cordant finds itself cleaning ‘everything and anything’ on buses, from needles to bodily fluids. ‘A lot of buses are used as mobile picnics,’ he said. The state of vehicles when they come back to a depot can vary, depending on the service. Some of the highest levels of litter in London are where the free newspapers are distributed. Also, certain times of day influence the condition of vehicles. One thing that is difficult to clean is chewing gum, especially if it gets embedded into the upholstery. Buses tend to be tricky environments to clean at the best of times, Guy said, with a lot of ‘nooks and crannies’ to negotiate. Making it hard is the fact there are a lot of different surfaces, from glass, plastic and upholstery to Formica laminate, rubber sills and gel coated panels. Greasy heads against windows and feet on seats do not help either. Also making it difficult is the tight parking of fleets at depots, making them harder to clean around. Despite all of these challenges, Cordant has impressed its customers by overcoming them. Its success at this is evident in the positive affect it has had in TfL’s Mystery Traveller Survey. With cleanliness playing a major role in the scores buses from each garage earn, Guy said the depots where Cordant works tend to be towards the top end of the leader board. As a result of the improvements it has put in place, Guy says de-merits towards the operators have decreased over the years. In line with what Guy says is its influence in creating a network wide fall in de-merits in terms of cleanliness, Cordant has grown consistently year on year. What sets the company apart, he claims, is its experience and expertise. Guy said the company ‘is acutely aware of the demands of a bus garage’. Unlike his competitors, he said bus and coach depot cleaning is one of the firm’s core activities, allowing it to specialise in this area. ‘We are dedicated to this and have been for many years’. Through this dedication, the company has become a multi million pound business attracting more than 100 clients, who are served by over 2,000 employees. 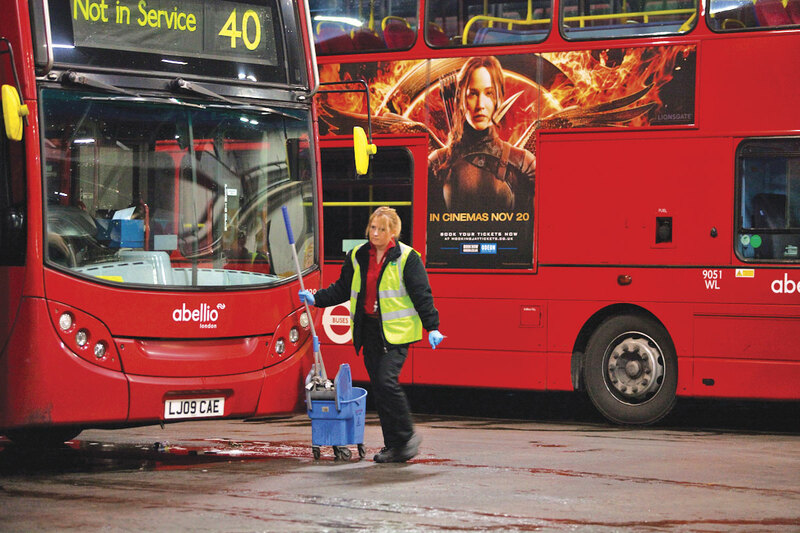 More than half of its turnover comes from bus and coach cleaning, with customers across the country, not just in London. For instance, it is the preferred coach station and travel shop cleaning provider to National Express, also taking on its work at certain bus depots across the country. Beyond the bus and coach industry, it cleans more than 120 locations for logistics specialists across the nation. Although its operations head office is in Wimbledon, the company can work across the UK. When Cordant takes on a cleaning contract, it will look at what measures it can put in place to make standards higher. It will also implement its own bespoke reporting system, which is a web based live portal. 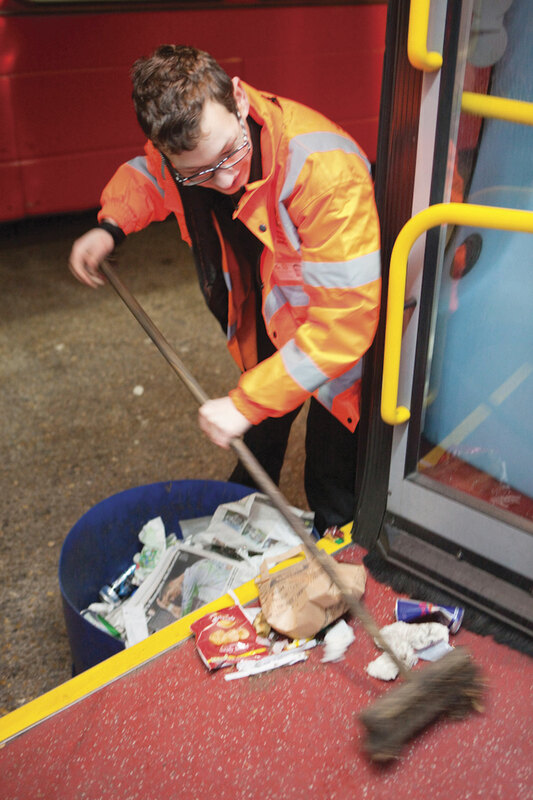 London is often seen to lead the way in future developments in the bus and coach industry, so it will be interesting to see if the rest of the country will follow the capital and place more of their cleaning activities with companies like Cordant. Considering the success the company has had in the city and elsewhere in the country, it would not be surprising if more operations start to take on its specialist cleaning services.